Star-shaped and swallowtail-shaped tiny, dark bumps in fine-layered bright bedrock of a Martian ridge are drawing close inspection by NASA’s Curiosity Mars rover. 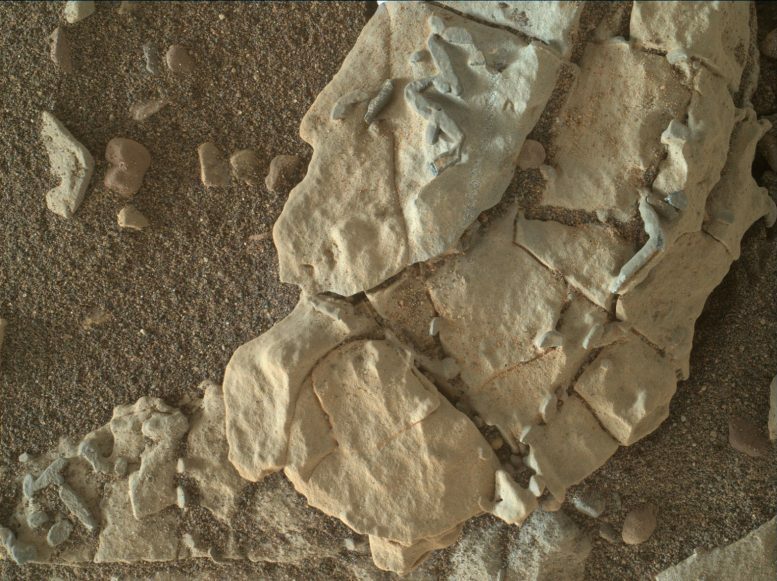 This set of shapes looks familiar to geologists who have studied gypsum crystals formed in drying lakes on Earth, but Curiosity’s science team is considering multiple possibilities for the origin of these features on “Vera Rubin Ridge” on Mars. 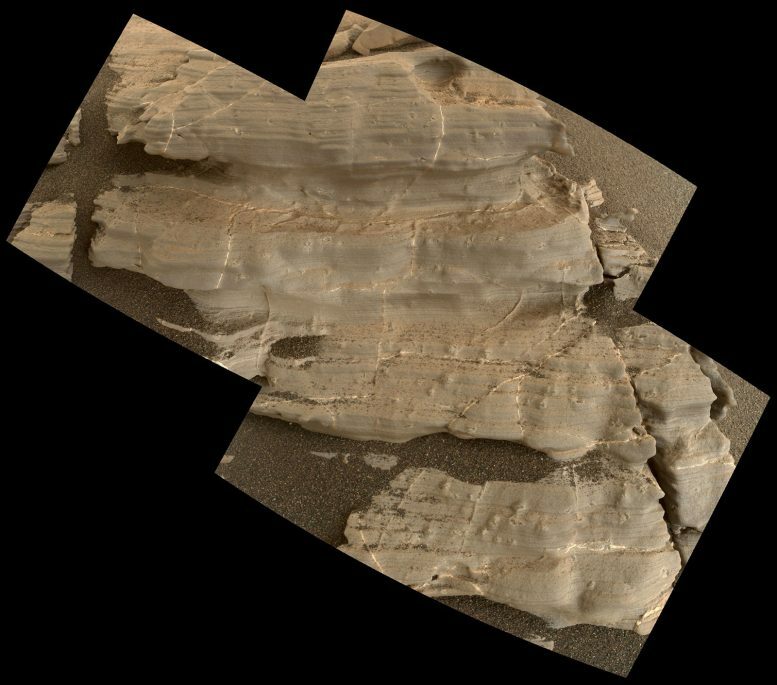 One uncertainty the rover’s inspection may resolve is the timing of when the crystal-shaped features formed, relative to when layers of sediment accumulated around them. Another is whether the original mineral that crystallized into these shapes remains in them or was subsequently dissolved away and replaced by something else. Answers may point to evidence of a drying lake or to groundwater that flowed through the sediment after it became cemented into rock. The rover team also is investigating other clues on the same area to learn more about the Red Planet’s history. These include stick-shaped features the size of rice grains, mineral veins with both bright and dark zones, color variations in the bedrock, smoothly horizontal laminations that vary more than tenfold in thickness of individual layers, and more than fourfold variation in the iron content of local rock targets examined by the rover. Vera Rubin Ridge stands out as an erosion-resistant band on the north slope of lower Mount Sharp inside Gale Crater. It was a planned destination for Curiosity even before the rover’s 2012 landing on the crater floor near the mountain. The rover began climbing the ridge about five months ago and has now reached the uphill, southern edge. 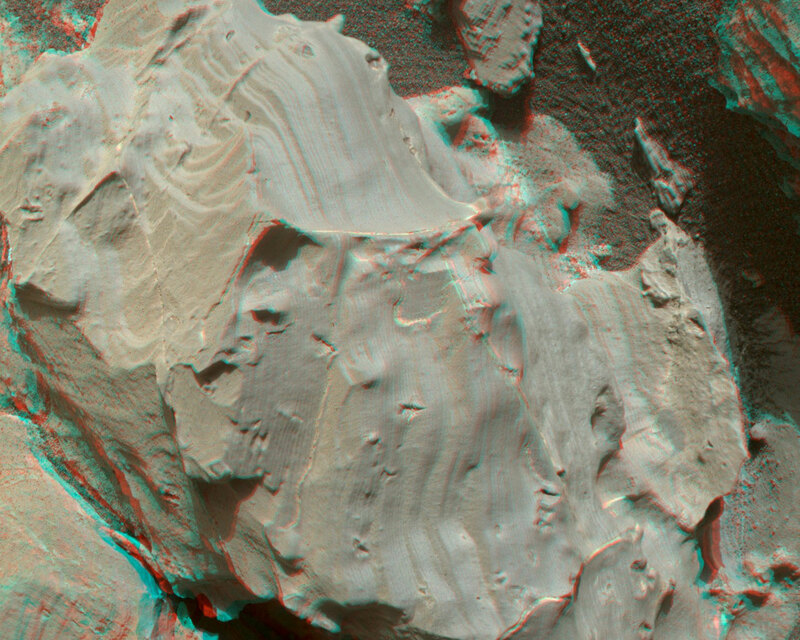 Some features here might be related to a transition to the next destination area uphill, which is called the “Clay Unit” because of clay minerals detected from orbit. The team drove the rover to a site called “Jura” in mid-January to examine an area where — even in images from orbit — the bedrock is noticeably pale and gray, compared to the red, hematite-bearing bedrock forming most of Vera Rubin Ridge. The small, stick-shaped features were first seen two days before Curiosity reached Jura. All raw images from Mars rovers are quickly posted online, and some showing the “sticks” drew news-media attention comparing them to fossils. Among the alternative possibilities is that they are bits of the dark vein material. Rover science team members have been more excited about the swallowtails than the sticks. 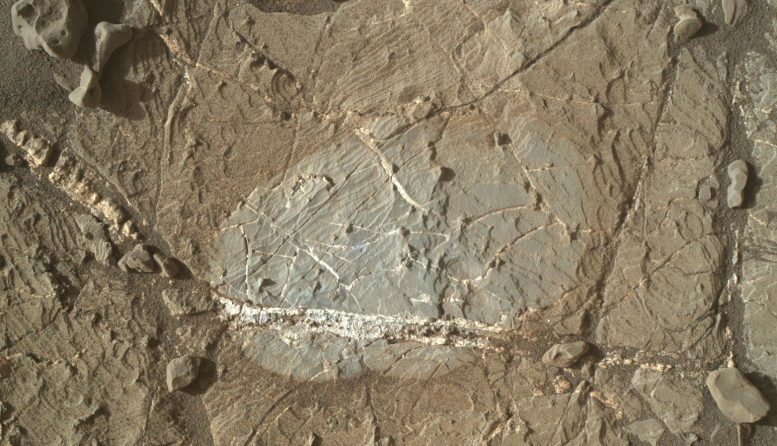 “In either scenario, these crystals are a new type of evidence that builds the story of persistent water and a long-lived habitable environment on Mars,” Vasavada said. 1 Comment on "Curiosity Rover Inspects Star-Shaped Bumps in Martian Bedrock"
Great,, curiosity is really doing a fine job,,any info that is gathered can and will be studied,,. any info received is amazing.